Last Friday, Hubs took a day off for some quality time with moi' i.e. Lovely Wifey. It was all planned in advance of course. In the few weeks leading towards the planned day-off, we received e-mails on Anya Hindmarch's as well as Valiram's sale to be held on certain dates. So the day-off coincided with the first day of those sales. To top it off, our trip to BB area has been long overdue with Hubs needing to do some minor repairs to one of his dress watch and the service centre is located in the same row as the locations for those sales. Great! Perfect. Anya's sale was great. Deals were definitely good. At first instance, I felt that the sale collection available were very limited. Macam tak ikhlas almost. Nonetheless, those who love Anya still kept coming in. We almost left if not for the usual Sales Assistant we usually engage with informing us of a different location for regulars. Better collection for sure and a lot more choices. I know some may argue that it's not fair. On the other hand, I can see the benefit from this method. This gives their regulars preferred treatment and ample opportunity to view more of their collection. 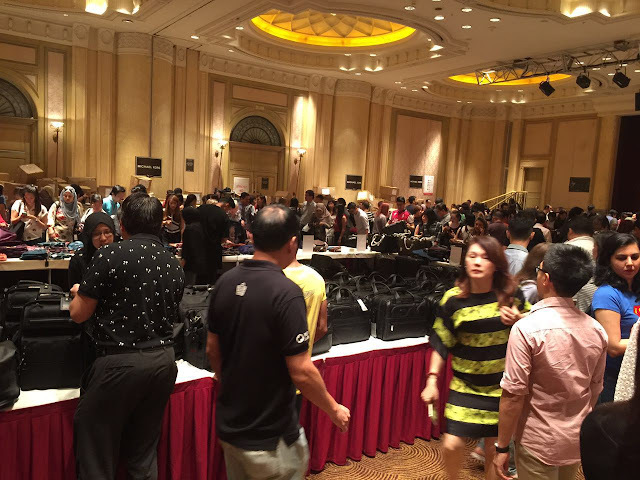 Perhaps they had received many complaints from their regulars beforehand from their previous sale whereby they didn't get the chance to view or purchase the previous sale collection. Then off to the Valiram sale. It's our second time attending one of their sales. Previously, we went on the second day and many of their items were already sold. This time we managed to get there on their first day. Oh my gaaaawddd, soooo many people. Take a look at the pictures below. These were taken before 12 noon yer. Itu pun ramai dah hold items while they tour other booths and some even already made payment outside. THESE PICTURES ARE MINE. NOT TO BE CIRCULATED OR REPRODUCED FOR ANY REASON OR OTHER PURPOSE WITHOUT MY PERMISSION. PLEASE REFER TO SIDEBAR FOR DETAILS. But please yer, not the "rempuhan and minah menjerit-jerit to get a number and buy a certain type of tudung" kind of crowd. There were lines going in. All coordinated and organised. The only "berpusu-pusu" was done and concentrated at the many different booths. Especially those selling Tory Burch and Kate Spade. Crowds were civilised and decent. Have not heard of anyone terjatuh or kena pijak kepala or injured to get to the items. The discounts were awesome, ranging from 50% -80% sales. 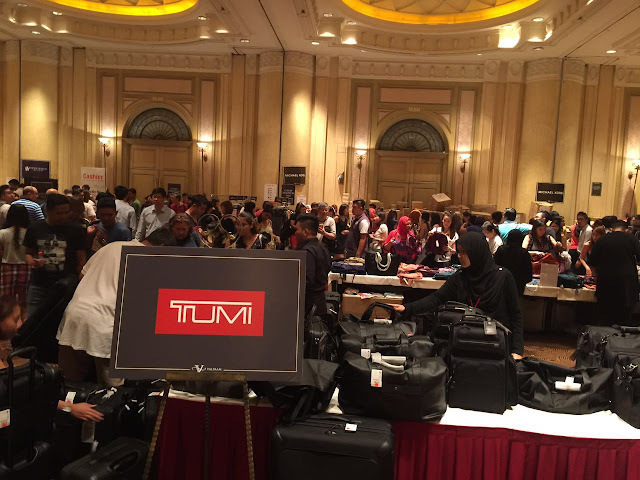 Branded items from Tumi, various luxury dress watches, Giuseppi Zanotti, Michael Kors, Victoria Secret, Bath & Body, Godiva, TWG and many more were up for grabs. I didn't even bother looking at Kate Spade and Tory Burch. Next time lar. I was not in the mood in getting my toes stepped on further, or worst, rolled on by those on wheelchairs. There, Alhamdulillah, dapat lar rezeki suami beanie from Tumi. Hubs also got a steal from Mont Blanc. We didn't want to spend too much time at BB area. So we quickly made a bee line for the cashiers outside the ballroom. I like standing in line and observing what people purchased. Like the last time, I can see many had borong for resale purposes or maybe made multiple purchases for their large families, to which Hubs doubts on the latter. Maybe next round I nak borong and jual jugak lar. Bring in my own 'rempuh' gang and spread out at different booths. I siap ckp ngan Hubs I'm gonna place two at the front, two in the middle and one at the back and attack each booth. The bigger ones should be placed at the front. Easier to infiltrate. Hihih. In line, I also observed many had purchased Tory Burch and Kate Spade as well as MK bags. What's up with MK yer? I really have to make a closer inspection of its appeal the next time round. All the women in line had at least one MK in hand. Am I missing something? Not forgetting those VS cosmetic bags with mini perfumes or shower gels. Must not miss them next time. Many would take these pictures and argue "Kata ekonomi gawat!". Well, that's one way of seeing it. Another view would be pasal ekonomi gawat lar orang tertunggu-tunggu for these sales. 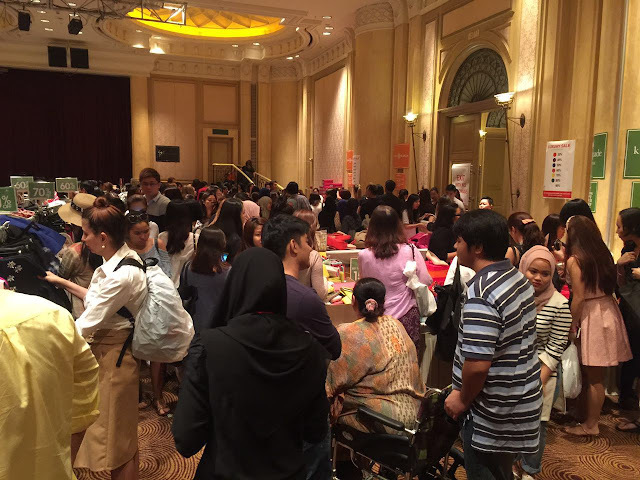 Good branded quality items at extreme discounts, mana hang nak dapat? When I shared these pics on my watsapp group, of course ada yang excited and asked for location, dates, etc. and there are those commenting "oooh, people living beyond their means and shopping based on wants rather than need bla bla bla". NORMAL. DON'T WORRY. TEPUK DADA TANYA SELERA. All are entitled to their opinion of course. By the way, the sales weren't just for us mere mortals yer. I saw one Puan Sri and children in tow as well as high ranking execs there too. They know when to snap a good deal when they see one. Everyone is allowed to be frugal where they can be. They just have to be smart about it. That's the end of our sale shenanigans. There's actually a continuation to our day off post-Valiram. A different one totally unrelated to shopping kind of post. Look out for that one.